When it comes to tablets, Apple defined the category with its iPad. Visit an electronics store and you’ll find plenty of similar looking competitors, yet with as many as 60 million iPads sold, you might not know any competition existed. With tablets becoming increasingly common at work, can anyone compete with Apple’s iPad as a business tablet? IDG Connect, a technology media firm (and subsidiary of PCWorld's parent company), conducted an iPad for Business survey to find out how IT and business professionals around the world how they use their iPads. Nearly everyone responded that they use it for reading, with over 70 percent globally saying they are buying fewer physical books and newspapers as a result. A majority also say they use it for Web browsing. This isn’t so surprising since tablets make a great content consumption tool. What’s more interesting is that 57 percent of U.S. users surveyed said they are carrying their laptop less, partially or completely replacing it with the iPad. Over half of the U.S. respondents said they use their iPad for communication, and 43 percent even said they use their iPad for tasks they would have otherwise used a smartphone to complete. This emphasizes that tablets aren’t just a reading tool, but also a communications tool, which may be why 79 percent of those surveyed “always” use their iPad on the road. IDG Connect’s data was collected from iPad users, but with competing tablets having similar--and in many cases, nearly identical--functionality, it shouldn’t be a stretch to conclude that tablets in general make great reading and communications tools for business, and that competing products are just as desirable. The numbers, however, don’t support this. 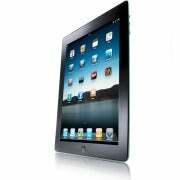 A November 2010 survey of 1,641 businesses conducted by ChangeWave showed that, at the time, iPads made up 82 percent of business tablet purchases, and that 78 percent of respondents planned to purchase iPads. : TThe recent IDG Connect survey results were similar, despite the explosion of iPad competitors in the past year: It found that 85% of U.S. buyers would stick with Apple’s iPad for future tablet purchases. Apple got there first, and apparently did it right as well. While some might think the iPad is all about hype, with Apple’s commercials and product placements influencing buyers, the IDG Connect survey found that 58 percent of U.S. business buyers based their decision on functionality. With Apple continuing to improve its product, and the iPad 3 rumored to have a faster processor and higher resolution screen, what can the competition do to break into business? If buyers are basing their decisions on functionality, then the competition needs to provide functionality that Apple isn’t offering. Manufacturers like RIM have tried smaller, more portable models, though the rumored announcement of an upcoming 10 inch model seems to confirm it wasn’t a success. Another approach is to add a keyboard to the tablet, making it easier to create content. Asus’s Transformer Prime offers this feature in the form of a keyboard/trackpad dock, though it’s still to early to see if it’s a hit with businesses. If manufacturers can’t beat Apple with features, then they’ll need to do it based on price. Functionality is important, but it’s always balanced against cost, and lower cost offerings like Amazon’s Kindle Fire can make it much harder to justify the added expense a superior product may bring. Eventually someone will find a way to come close to the iPad on functionality, yet keep the costs lower than Apple’s, which is when we could see a new king of tablets for business. Watch for a beefier processor, sleeker display, and perhaps a smaller sibling -- but when? As iPad 3 speculation slows, a new Apple tablet begins to take shape.